Six of the FAB Seven watching Brian Gray, the new member of the team, signing the 2010 Audit Report: Ayyanan Ramaiah, Toshiyuki Kimura , Hyuck Jong Kim, M, Xiaoyun Sun, Alice Peterson and Tamara B. Vorobieva. "Exciting" is perhaps not the answer you would expect from the Chair of an audit board when asked how the past two weeks of browsing through the ITER Organization's financial records and statements went. But that is exactly the answer Alice Peterson, the Chair of the Financial Audit Board (FAB) gave after she had presented the Audit Report to the ITER Director-General. "We are a small team, so we have always worked very closely together," Alice explains, "but this time we could sense that the team has become more cohesive, that we have the same mindset. We all come from the same industry, but we work on different aspects, look at different issues." Over the past two weeks Alice and her colleagues from the Member states audited the ITER Organization's 2010 Financial Statements. 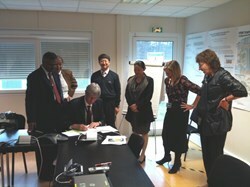 On Friday morning they handed over the Audit Report to the ITER management. Alice summarized the results: "ITER is still a young organization, and one can sense that it is developing and evolving just like the FAB itself. I have worked on many projects, but this one is unique and fascinating in many ways."